Stenopterygius by Josef Moravec. Original oil painting 24" x 18". (Framed). * Available for sale to museums and serious art collectors. 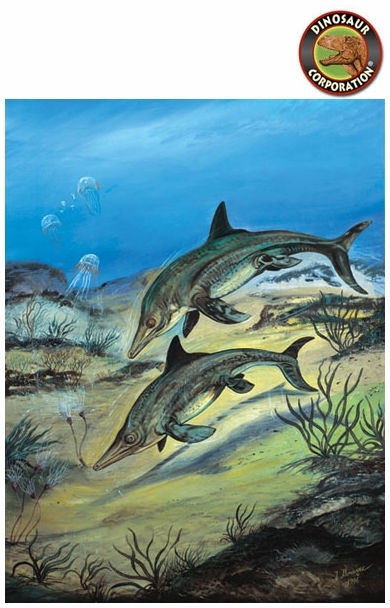 Stenopterygius, one of the Ichthyosauruses, was an aquatic reptile that filled the same niche that the dolphins and porpoises exist in today. They were fast swimmers and fed on fish and other sea life. Some typical features of this reptile are long jaws with numerous teeth, eyes set within a ring of bony plate, the reduction of the pelvic girdle components, the associated paddle, and subdivided finger rows. The most astonishing feature of the Ichthyosauruses is that they gave live births. Fossils have been discovered that show a mother that had died while giving birth. The Ichthyosauruses were most prevalent during the Jurassic period. TIME - Early and Middle Jurassic. RANGE - Europe (England and Germany), South America. SIZE - Up to 6ft 6inches long (2m). DIET - Fish, shellfish and other invertebrates. Stenopterygius, Jurassic Reptile, Art Picture, 8.5" x 11"
Stenopterygius. Art Picture is printed on glossy photo paper. 8.5" x 11"
Stenopterygius. Printed on premium photo quality super "B" paper 13" x 19". Original oil painting by Josef Moravec is in the art collection of Dinosaur Corporation. Size 24" x 18". Stenopterygius, Jurassic Reptile, 20" x 24"
Stenopterygius. Jurassic reptile. Printed on premium photo quality super "B" paper 20" x 24". Stenopterygius, Jurassic marine reptile. Framed in 14" x 17", double matted in glass.